Once you set up a still life you're happy with you can determine what size to make your canvas (or what size pre-stretched canvas to buy if you don't want to stretch your own). Start by sitting in your chair at your easel in the same spot you will be sitting when you begin to paint. You can test your spot by holding a brush in your hand and pretending to paint on an imaginary canvas on your easel. After determining the exact spot for your chair, next turn to your still life (it helps to have a chair that swivels), and view it straight on with your shoulders square with your still life. This is the exact perspective you will be drawing your still life from. It is also the perspective we will use to determine the size of your canvas. It helps to have a second person assist you with this next step. Sit in your chair viewing your still life while a second person lays a yardstick (or metrestick) on the front edge of the table, perpendicular to your line of sight. Now have your helper move the yardstick left or right until the zero end lines up with the point on the left where you want your still life to begin. Now, without moving the yardstick, make note of where the right edge of your composition lines up with the yardstick. 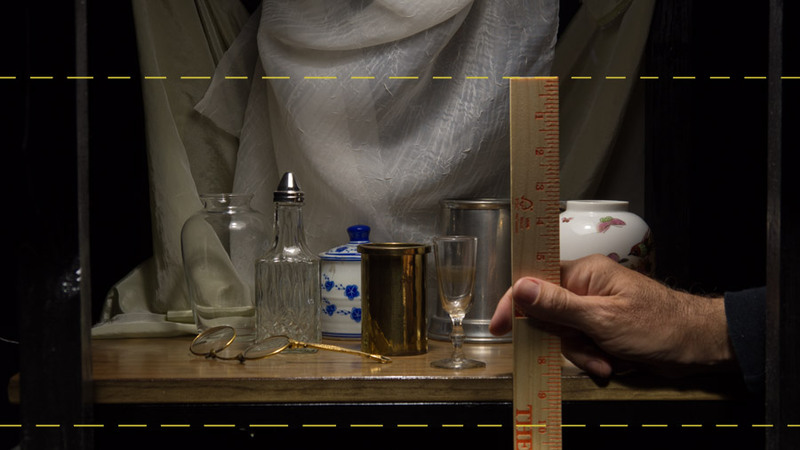 This measurement will be used for the width of your canvas, assuming your still life will be painted life-size (which I recommend). We will determine the height of your canvas the same way, but will measure vertically this time. Now you can take these measurements and order your stretcher strips or pre-stretched canvas. You will need to round your numbers to the nearest available stretcher strip size or pre-stretched canvas size. In other words, if the width you measured was 19.2 inches, you will need to compromise and make your canvas 20 inches wide instead. Obviously if you are cutting your own stretcher strips you can make them any size you wish. One note: it never hurts to make your canvas a bit larger than what you measure. I have found with experience that I almost always like the extra room. Especially because you will be painting life-size or larger, you don't want to be forced to "squeeze in" your objects because your canvas is too small. Also, if you frame your finished painting, the frame will cover up a tiny bit of canvas along the edges. So if you measured 18 inches for the width, it wouldn't hurt to stretch your canvas 20 inches wide, or even 22 inches wide. Keep in mind that if you really want to make your canvas smaller after the painting is finished you can always restretch your still life painting onto shorter stretcher strips. Unless you will be using a pre-stretched canvas, you will need to stretch your canvas onto stretcher strips, which I demonstrate in this video. It is much easier to paint on stained canvas than it is to paint on white canvas. Not only is it easier to judge your values, but it is also easier to get full coverage with one coat of paint. Watch the video below to see how I do it. In the video I am using different paint than I currently recommend for the staining process. You can find my current recommendations on the supply list. I recommend staining your canvas outside, but if you can't do that, make sure you have very good ventilation. 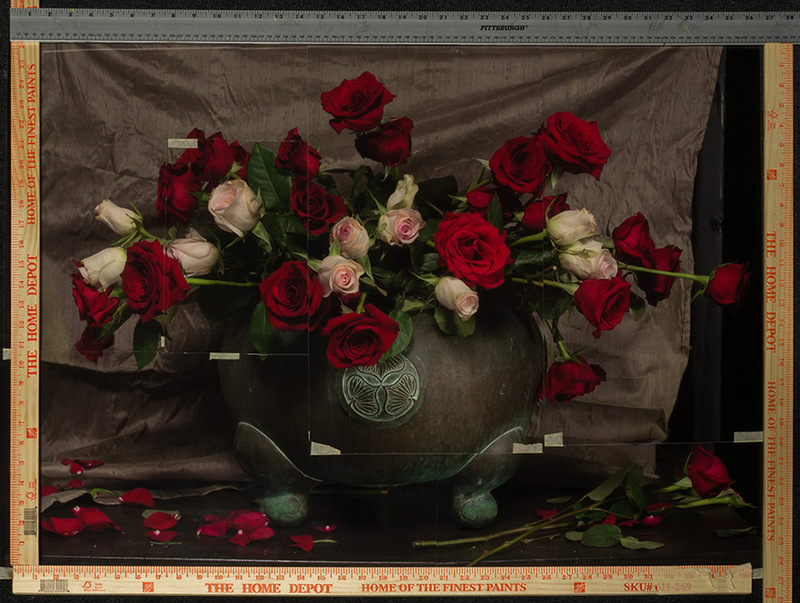 Lay all the photographs of your still life out on a table or on the floor. 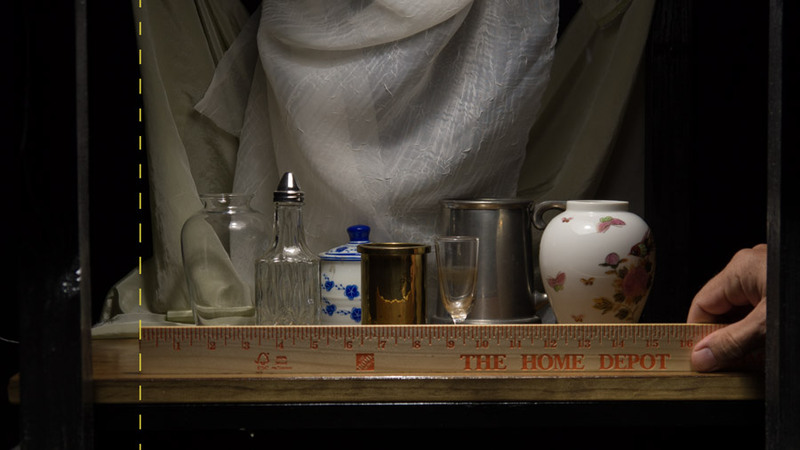 Arrange them, overlapping if necessary, to create one large image of your still life. Assuming your photos are the same scale as your painting, simply measure the dimensions of your canvas directly from the large pieced-together image. If you're working from a photo that is smaller than life-size (not recommended), you will need to measure your photo and then multiply the width and the height by a given amount, depending on how big you want your canvas to be. It is much easier to paint on stained canvas than it is to paint on white canvas. Not only is it easier to judge your values, but it is also easier to get full coverage with one coat of paint. Watch the video below to see how I do it. In the video I am using different paint than I currently recommend for the staining process. You can find my current recommendations on the supply list I recommend staining your canvas outside, but if you can't do that, make sure you have very good ventilation.